Sugar Ants in Your House! Ants in the house can be embarrassing, especially when company arrives and sees your little house guests walking on the counters. People can immediately think your housekeeping skills are not up to par and that is why you have ants. Not true!! Ants that have invaded your house have little to do with how you keep your house. Instead it is a testimony to the ants ability to find food no matter how difficult it may be. Black sugar ants are experts in this. In the house we currently live in, we have never had a problem with ants.. until recently. One day, after a large rain storm, we suddenly had small black ants in our kitchen. Heavy rain often forces them in. I was actually out of the state on vacation with my family when this occurred, but our dog sitter told us about them. They had a solid week to get established before we got home. Coincidentally, our daughter, who lives two hours away, started having problems with ants in her house following that same storm. How weird is that! When we got home from vacation, little black sugar ants were everywhere. Hundreds of ants were on the counters and in the cabinets. We initially spayed the ants with a 50% alcohol and water solution, which kills them immediately, but does not control them. I mixed up some commercial household insecticide. I sprayed between the counter and firewall, along the baseboards and every other place except on the counters themselves. We had hoped that this would deter them. No such luck. This killed many ants, but they quickly found ways around it. The ants continued to come and it quickly became obvious that alcohol and sprays was a losing battle. How to Get Rid of Sugar Ants for Good! 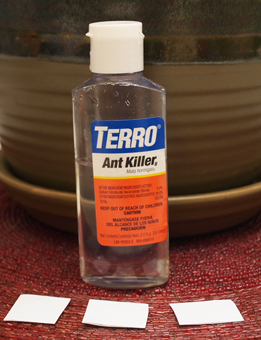 Terro Ant Killer comes in different containers types. We purchased the Terro bottle type. It has a squeeze dropper bottle with several detachable cardboard squares where drops are applied. With this method you can have as many poison sites as you need and are not limited to a specific number of trays that come in the tray package type. 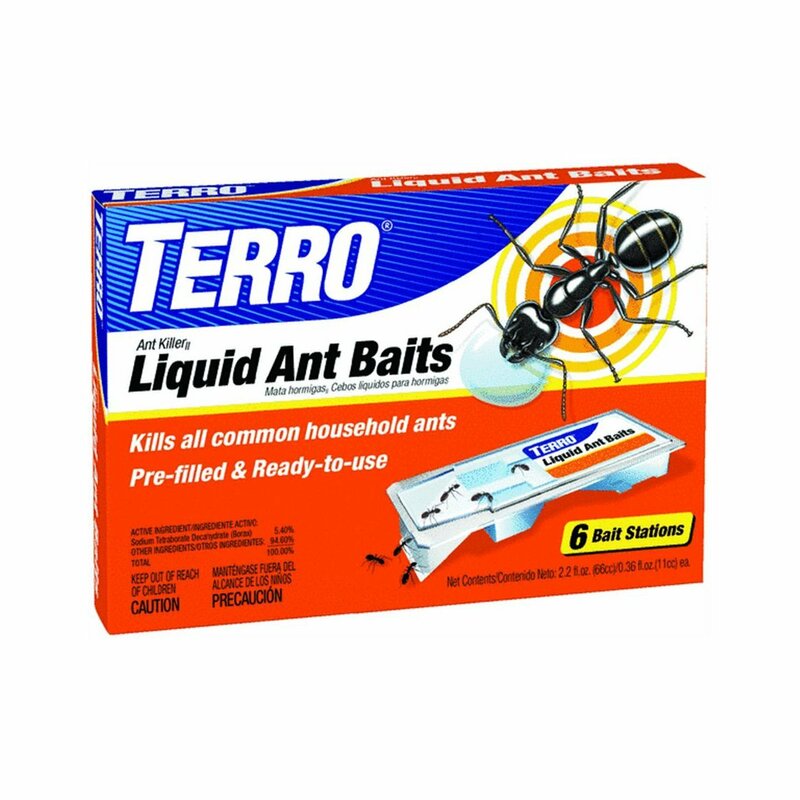 Terro Ant Killer's inactive ingredient is a thick clear liquid, probably corn syrup, with borax as its active ingredient. Borax is an effective ant killer and is much safer than chemical insecticides. Still keep children and pets away. You simply squeeze several drops onto the squares and place them where the ant numbers are heaviest. As the ants consume the liquid you will need to reapply the drops. Where drops are not consumed as quickly, the liquid tends to skin over on the surface after many hours. I would reapply the drops as needed putting it on top of the liquid that had skinned over. Ants love this liquid. Within 12 to 24 hours there will be long trails of ants coming to and leaving the ant trays or bait squares. As hard as it will be, you must leave the trails alone. Don't spray the ants. You must let them take the bait back to the nest to permanently get rid of them. Once the queen is dead, the ants will soon be gone for good. Depending on the amount of ants you have and how long they have been in your house, it will take three or four days before seeing a large reduction in ants. You will start to see dead ants accumulating along the trail as well as live ones still feeding. After the majority of ants are gone, you will still see stragglers for several days. It took me a whole week before I was only seeing a dozen ants a day. Another week and all the ants were gone completely. So, if you are overrun by ants and sprays aren't working, it's time to put out the baits. To see all of Terro Products, click on this link. Turf Pests Turf Pests can injure or destroy a lawn. Find out how to identify and control common lawn insect pests. Grass Diseases Turf Diseases are so often misdiagnosed. Treating them is not as perplexing as it may seem. Check out our disease page and learn how. Controlling Crabgrass and Foxtail Weeds Crabgrass and foxtails can quickly take over a lawn. Find out what they are and how to control them.